Low Carb Enchiladas are delicious and easy to prepare. This traditional Mexican main dish can be filled with a variety of ingredients, including meat, cheese, beans, potatoes, vegetables, seafood or combinations. 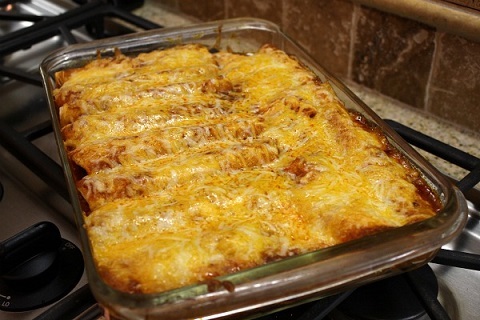 American Enchiladas ...that is Southwestern-Style Enchiladas, are a bit different. That recipe is also on this restaurant recipe website. Fillings for enchiladas may be almost anything, depending on the cook’s taste and what is in the refrigerator. 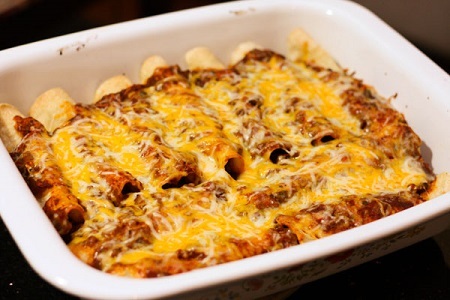 Since the filling and sauce are prepared before assembling the enchiladas, baking in an oven serves to heat through rather than cook the dish. Common garnishes are sour cream, lettuce, olives, chopped onions and fresh tomatoes. An enchilada is a tortilla (typically a corn tortilla) rolled and stuffed, usually with a mixture containing meat and/or cheese and served with a sauce spiced with chilies. Corn tortillas are usually fried in oil and then dipped in the chosen sauce before filling them. However this recipe uses flour tortillas. Either is fine. Your choice. The word enchilada literally means “seasoned with chilies”, and the traditional enchilada sauce is just that…dried red chili peppers soaked and ground into a sauce with other seasonings. Red enchilada sauce may also be tomato-based with red chilies, while green enchilada sauce is usually made of tomatillos and green chilies. Note: This recipe uses Ancho chili powder in place of dried, soaked chilies to make the sauce. Low-carb flour tortillas are used raw, instead of fried in oil. Carbohydrates listed are based on the use of low-carb tortillas. There are approximately 10.80 carbohydrates for each enchilada assuming the use of low-carbohydrate tortillas which contain about 4 carbs each. Preparation time: 40 minutes for Enchilada Sauce Recipe (Click for Recipe). Makes 10 enchiladas. Enjoy your low carb enchiladas and the company of those you share them with! Did you know? Enchiladas originated in Mexico, where the practice of rolling tortillas around other food dates back to Maya times. 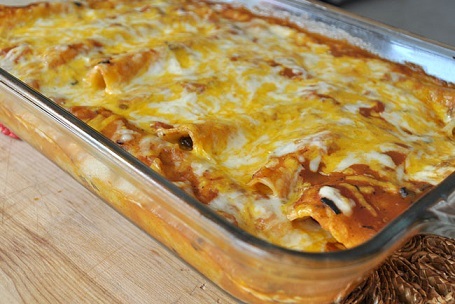 Enchiladas were mentioned in the first Mexican cookbook, El Cocinero Mexicana ("The Mexican Chef"), published in 1831.